Attention Ice Oval ISR Racers!! Bluhm Enterprises and Wahl Brothers Racing, have teamed up to produce the brightest and most compact LED taillight system, ever seen with a totally self contained battery system- all inside the taillight lens!! 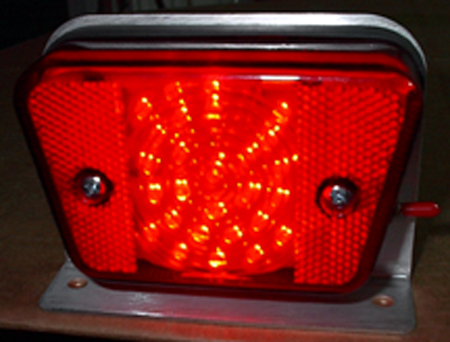 This unit comes after much research, and determination to build a quality taillight that adds safety. Our new system runs on battery and will last for days without changing the battery! 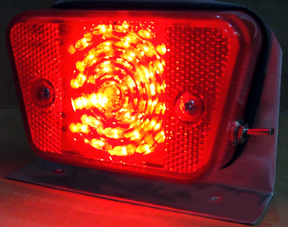 If you are racing, the new ISR rules require a LED taillight that is ON anytime the sled is on the race surface. This new taillight is the answer. A simple and lightweight design allows for quick installation. 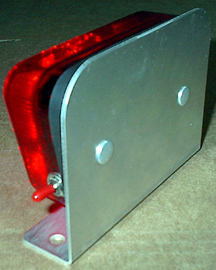 Features we are promoting on this light unit are: -Complete and sealed LED Race Light system -Ultra Bright LED Board with battery enclosed in compact & lightweight aluminium bracket with on/off toggle switch. -No need for wiring or connecting external parts. -Operates for days on battery, change battery in seconds. -System designed specifically for Race needs, can be modified to have brake activated from sled and "ON" function from LED battery. This light kit comes complete and ready to race for $79.99. The kit comes as pictured, completely assemboled and includes the battery, so you just mount to the sled chassis, flip the switch and you are racing!! Super easy.